Walk through the tourist centre and you’ll come across several places touting blind massage. The Blind People Light Centre at 12 Hong Bang came highly recommended by a local who goes there at least once a week and swears by it. Indeed, most of the patrons are locals who seem comfortable and at home as they get kneaded by a blind masseuse. An hour’s body massage costs only 70,000 VND and it feels like a hybrid between Thai-style pressure points and being tenderised like a tough steak, from your scalp all the way to the toe joints. The strokes are vigorous and they use hot stones too. The facilities are modern but basic and the no-nonsense massage means little regard for exposing your bits and bobs to the person laying next to you – ensure they draw the privacy curtain at the start. If you’re sensitive in certain areas, most of the masseuses understand basic massage-speak in English so let them know if it is too hard, soft or needs to be avoided. There’s a lockable drawer under the bed for your belongings. We noticed our masseuse did not change our sheet after use. Bringing your own sarong would not be a bad idea. Still, for 70,000 VND, you can get rid of the aches from that long sleepless bus ride. 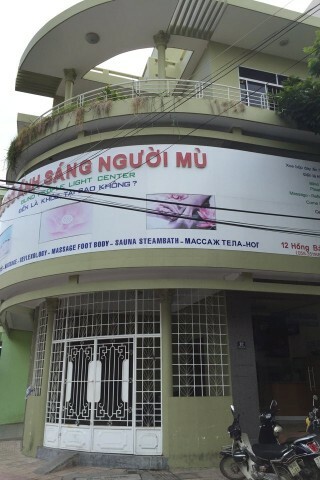 Admission: 1 hour body or foot massage, 70,000 VND; 2 hours 140,000 VND; sauna 50,000 VND.